Here are some facts about Prince Albert. 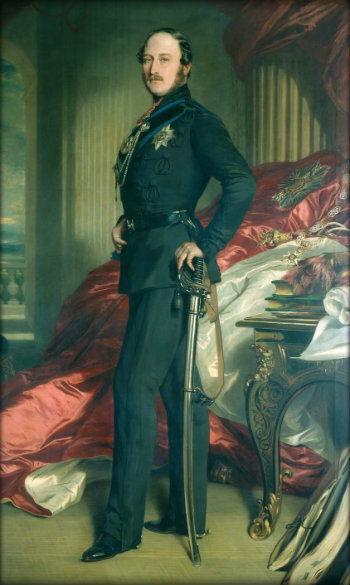 Prince Albert was the husband of Britain’s longest reigning monarch, Queen Victoria. They were married for 21 years until his death in 1861 at age 42. Albert was born in Germany on August 26th, 1819 and studied music, art history, law and philosophy. It was decided he would make a suitable husband for Queen Victoria and they were married in 1840. In 1841 he became chairman of the Royal Commission, set up to promote the arts. He became a successful art collector, buying valuable and quality paintings. Albert was good with the Royal finances and by 1844 had enough money to buy a house on the Isle of Wight for the family. Osborne House was designed to look like an Italian villa. At first Prince Albert was not really poplar with the British people. He became the Queen’s private secretary after the death of the Prime Minister in 1848, and this helped to improve his public image. Prince Albert helped to organize the Great Exhibition of 1851 to celebrate the might of the British Empire. He used money from the exhibition to build some of London’s museums. The Victoria and Albert Museum was founded in 1852. It was originally referred to as the Museum of Manufactures, and then the South Kensington Museum before gaining it’s current name in 1899. Albert also helped to address the problem of child labour in factories and workshops. He supported more modern universities and took an interest in science, the arts and industry. Queen Victoria and Prince Albert were shot at several times by assassins. On one occasion, Albert his wife’s life by pushing her out of the path of the bullet. Prince Albert died in December, 1861 after being ill for 2 years. He probably died from typhoid, although other historians suggest that he may have had cancer. Despite Albert’s request that no statues of him be built, there are dozens including London’s Albert Memorial. The towns of Lake Albert in Africa and Price Albert in Canada are named after him. What next? Discover more facts about the Victorians by visiting our Victorian resources page. It really helped my homework a lot!! Glad we were able to help. Thanks for letting us know, Suan.